"A Time Of Crisis", the comeback album of the US power/thrash metal legends HERETIC, will be released on July 26th at the Headbangers Open Air festival. They have stayed true to their roots and created a really solid album in the best US metal tradition: heavy, melodic and aggressive. Two songs from the album, Remains and Police State, have been available for streaming from our YouTube channel: www.youtube.com/MetalOnMetalRecords since over a month. We have now prepared a short promo clip (featuring a fragment of another song, "For Your Faith"), which you can watch at this location. Check more info about "A Time Of Crisis" and see the high-res artwork on the page of this release. 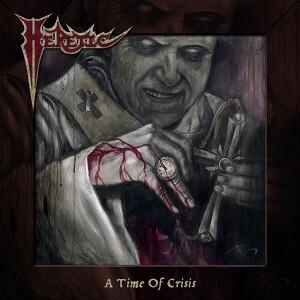 From now on until July 22nd you can pre-order HERETIC "A Time Of Crisis" CD from our SHOP page, with 2,00 Euro discount. After this day the price will revert to the standard 12,00 Euro for the CD. You can also pre-order the album as digital download (WAV files) directly from us, from our Bandcamp page. After July 26th it will be distributed digitally by CD Baby and made available also from iTunes, Amazon MP3, eMusic and other retailers.